We know from examining our charts and graphs that the good people of Brazil are crazy about SketchUp. We can officially add 3D modeling to the long, long list of things for which that country is famous. 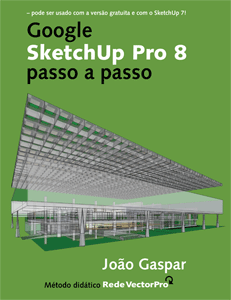 The first book about Google SketchUp 8 is now available, and it’s in Portuguese. Written by architect João Gaspar, Google SketchUp Pro 8 passo a passo was launched in Sao Paolo on December 3rd, 2010. It’s the author’s third book about SketchUp; he also wrote volumes about SketchUp 6 and 7. Thanks for the note, Aidan! The VectorPro Network and I were very excited about it! The more books and articles we have about SketchUp Pro the better. I still see virtually no job ads asking for SketchUp skills. This reflects a reticence on the part of employers to recognize SketchUp Pro as a high level design tool. There is a mis-match here. The proliferation of SketchUp (free) has been amazing, and now effort needs to be expended by Google to extol the virtues of Pro as a professional tool to rival, or at least be used with, AutoCAD, 3DSMax, Solidworks etc. Congrats Joao, I will read this as soon as I've brushed up on my Portuguese! Here in Brazil we have lots of architecture and design offices asking for SketchUp users. In my perception, it´s the second most used software in the AEC industry, just behind AutoCAD. I believe that in my country Google´s challenge is telling people the difference between free and Pro versions, and why professionals shoud use the Pro version. Aidan, I had the opportunity to meet John and his books, in fact I have them all. It has excellent technical and didactic quality. The John also wrote a version for Spanish. The school VectorPro might as well be recognized as an official school of Sketchup in Brazil.